Robin Carpenter (Holowesko) crossed the finish line behind stage winner, Alex Howes (Team USA) to gain 6-seconds on the stage that had an average speed of 28.3 mph, securing his overall victory for the second year in a row. Jacob Rathe (Jelly Belly) came across for third. Gavin Mannion (UHC) and Evan Huffman (Rally) finished in the front group to secure second and third overall on GC. GC contenders were separated by only a few seconds at the start of the Archie Butte Circuit road race, as the men raced 81.6 mile / 5-laps. Teams were prepped for a stressful day, as the KOM competition was also close, with only a 2-point difference between Movistar Team Ecuador and Canel’s Specialized. Jefferson Cepeda (Movistar) was able to hold on, taking the jersey after a hard-fought week. The finished became chaotic as the men’s field caught the women’s field only 500meters from the line. Stephen Bassett (Silber) had attacked not long before, with Carpenter behind, when putting in a dig for the line, crashed into Whitney Alison (Colavita). 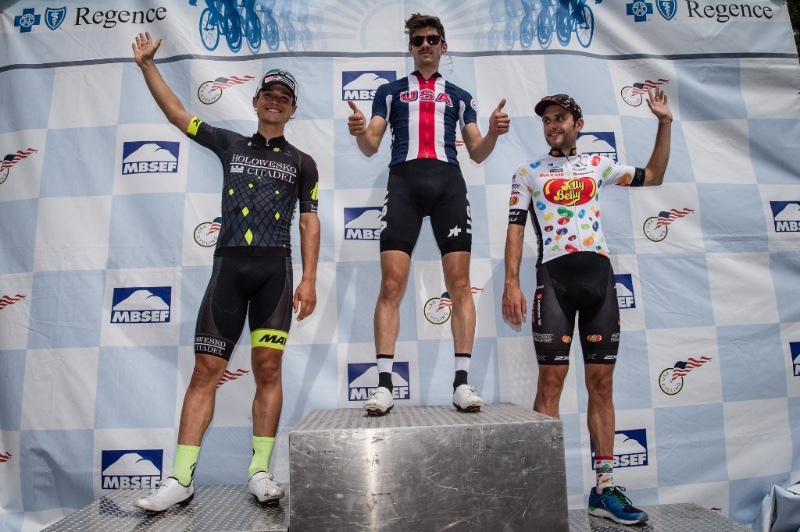 Taylor Shelden (Jelly Belly) took top points on the first sprint of the day to secure his first green sprint points classification jersey of his career. 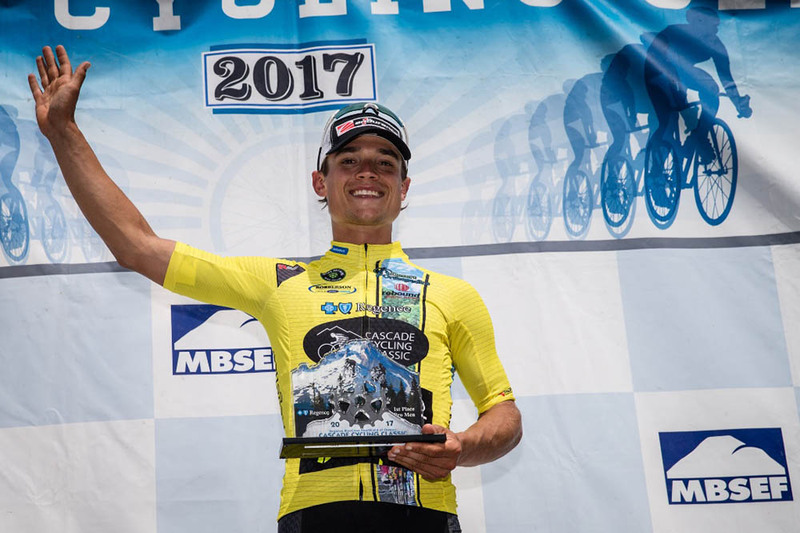 Luis Villalobos (Aevolo) kept the best young riders jersey. Top Canadians overall were Nigel Ellsay (Silber Pro Cycling) in 7th, Travis Samuel (H&R Block Pro Cycling Team) 9th and Jack Burke (Aevolo) 11th. 6 Gavin Mannion (UnitedHealthcare Professional Cycling Team) all s.t. 28 Lance Haidet (Aevolo) all s.t. 30 Jacob Sitler (CCB Velotooler) s.t. 32 Travis Samuel (H&R Block Pro Cycling Team) s.t. 39 Cortlan Brown (Hangar 15 Bicycles) s.t. 41 Chad Beyer (Hangar 15 Bicycles) s.t. 50 George Simpson (Gateway Harley-Davidson Trek U25 Development Team) all s.t. 59 Gasore Hategeka (Team Rwanda) both s.t. 63 Jean-Denis Thibault (H&R Block Pro Cycling Team) both s.t. 73 Bonaventure Uwizeyimana (Team Rwanda) all s.t. 79 Adam Roberge (Silber Pro Cycling) all s.t. 84 Aria Kiani (Team Mike's Bikes) all s.t. 88 Robert Gutgesell (Trek Red Truck Racing) all s.t. 93 Ulises Alfredo Castillo Soto (Jelly Belly p/b Maxxis) all s.t. 99 Logan Owen (USA National Team) all s.t. 101 Marc-Antoine Soucy (Silber Pro Cycling) s.t. 109 Thomas Soladay (Rally Cycling) all s.t. 113 David Kuhns (Team Oregon p/b Laurelwood Brewing) s.t. 120 Efren Santos Moreno (Canel's - Specialized) all s.t. 124 Joshua Kropf (Smart Savvy+ Garneau) s.t.